Commercial & Domestic Rubbish Removals Kensington SW5 | RDA Cleaning & Maintenance Ltd.
You have some rubbish that you need to be taken care of? Don’t worry we have it covered. RDA Cleaning & Maintenance Ltd. is a professional waste disposal company, specialized in rubbish removal Kensington SW5 services. All the services that we provide are great for both residential and commercial clients and are in accordance with the British waste management requirements. Our vetted professionals do their best on the job. That means that our company can guarantee you a high-quality service thanks to them. But not only are our service of the highest quality, they are at affordable prices as well. RDA Cleaning & Maintenance Ltd. is an experienced rubbish removals company with big potential to become a leader in market. We have been in the industry for more than a decade. This is the time we have learned to be always in time and in the service for each individual customer. Being appreciated for our qualitative job today 96% of the feedback we receive is positive. We also offer some of the lowest prices in the field. 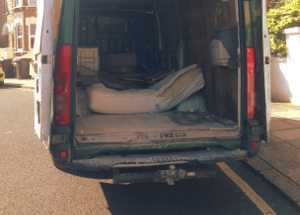 Our Kensington SW5 rubbish collection service price includes the transportation fees, too. Our hassle-free rubbish removal service is performed by specially educated, trained and prepared technicians. They are all vetted and fully insured. Don`t hesitate to ask for an advice or discuss the waste disposal in Kensington SW5 with our polite removal operators till they find the best solution for you. It`s their job. Note that the service is at first quoted, because neither the price, nor the duration is fixed. The rubbish removal specialists at first examine the property - loft, garage, apartment, house, basement, commercial IT or Tyre building, warehouse and etc - to see its size and to check the volume and the type of the rubbish. Last, but important thing, keep in mind that we deal with any junk - excluding hazardous, medical or building materials and products. So, if you wish to hire a professional rubbish removal Kensington SW5 company that will do their job with the fastest of means and no hassle, then, by all means, please give us a call at 020 3404 1646 or use our online booking form and we will be straight on the way to your location. Lern more about our rubbish removal deals and get a free quote!